Identifying a void in the cannabis marketplace around education and transparency, West Seattle recreational cannabis dispensary, Origins Cannabis launched Origins Lifestyles Spectrum Menu (http://www.originscannabis.com/menu) to help guide cannabis consumers on what cannabis strains or products will best fit their lifestyle and meet their desired outcomes. Across the current retail cannabis landscape, most dispensaries and brands are focused on selling cannabis to consumers based on THC content (which is often inflated). However, THC is just one of the components in cannabis. There are more than 100 cannabinoids and terpenes in cannabis. How Does Origins Lifestyles Help Cannabis Consumers? To properly experience quality, cannabis consumers and patients need guidance on which strain or product will help them accomplish their desired results. 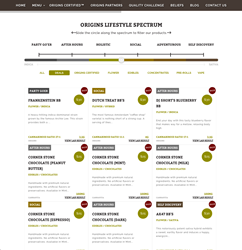 Origins Cannabis’ proprietary Lifestyles Spectrum allows consumers to match their desired outcomes based on their personality type: Party Go’er, After Hours, Holistic, Social, Adventurous, and Self-Discovery. Based on the consumer’s personality type, the Lifestyle Spectrum provides recommendations on which strains and products will best suit their needs. Origins Lifestyles are arranged by cannabinoid profile and terpene content, which helps experienced and new consumers identify and explore cannabis with their eyes and minds wide open. To ensure the scientific integrity of recommendations, Origins Cannabis conducts rigorous sourcing standards, while performing additional independent testing on all the products they carry.